On Oct. 11, 2010, former BYU football wide receiver Ben Cahoon (BS ’98) grabbed a speeding nine-yard pass, the 1007th catch of his Canadian Football League (CFL) career. 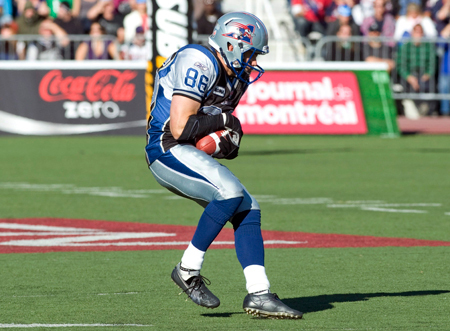 The stadium of Montreal Alouettes fans roared, play stopped, and players from both teams congratulated the former Cougar on becoming the new CFL all-time receptions leader. The Canadian football star set several records at BYU in 1997, becoming that year’s top receiver with 57 catches for a total of 931 yards and receiving 219 yards in one game. Cahoon has been playing for the Montreal Alouettes since he graduated from BYU. He only planned to play one year, but 13 years later, he’s still catching passes.